The largest project ever undertaken by the University of Maine, the new 88,000 sq. ft. Student Recreation and Fitness Center, designed by Cannon Design, is centrally located on the University of Maine’s campus. 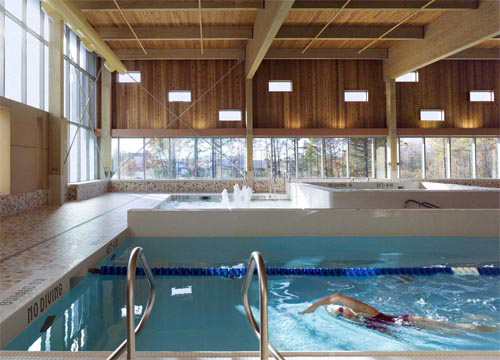 While the center strikes a harmonious balance with its natural outdoor surroundings, Counsilman-Hunsaker, the lead aquatic designer, designed an indoor leisure pool to complement the lodge-type natatorium, overlooking the rustic beauty of New England. The University of Maine achieved the U.S. Green Building Council’s Leadership in Energy and Environmental Design (LEED) Silver certification for energy efficient design.